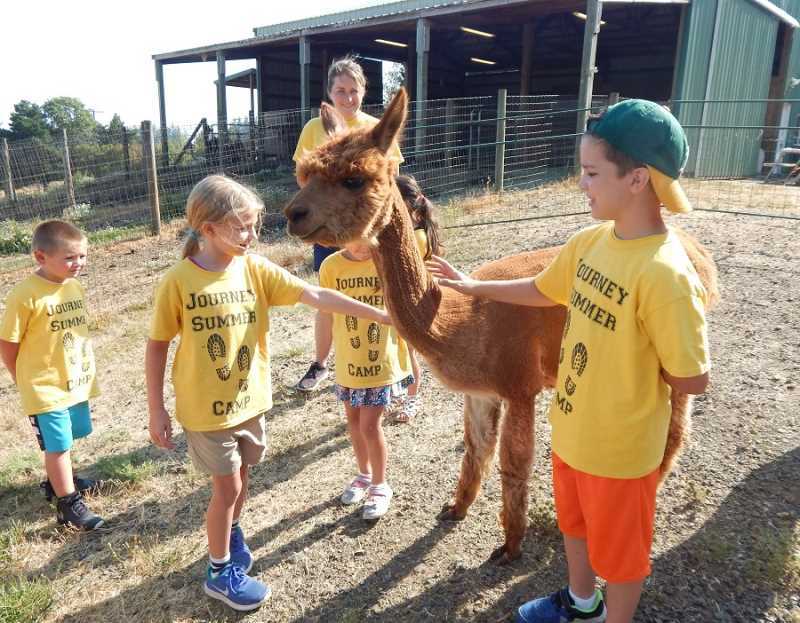 In early August, 10 young day-campers ventured into a pen filled with a dozen alpacas at the Alpacas of Oregon farm outside Sherwood, and it was hard to tell whether the kids or the alpacas were more excited. 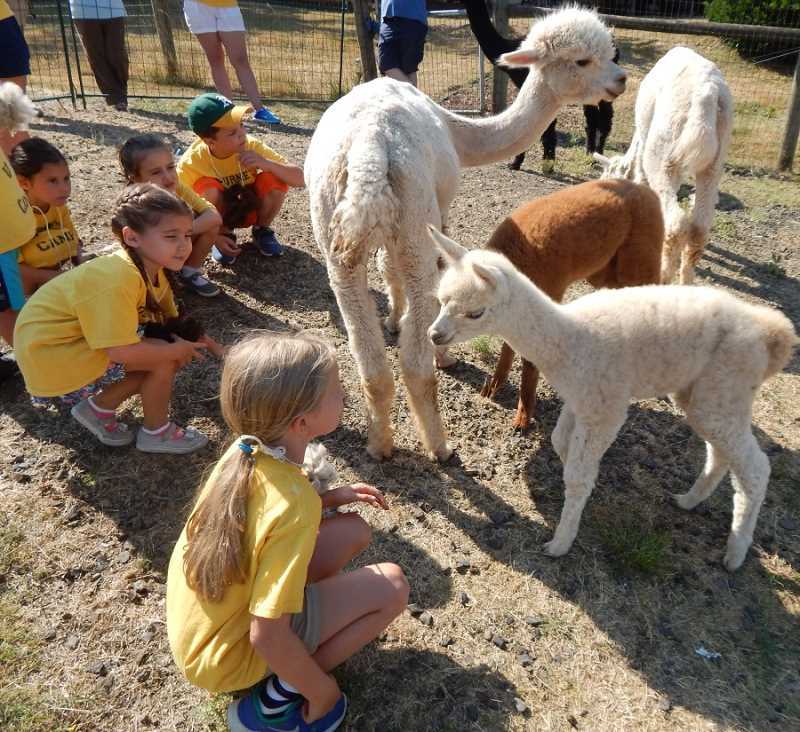 The first- and second-graders from Gaarde Christian Church's Journey Summer Camp in Tigard took a field trip (literally) to the alpaca farm for a tour and some hands-on experience with the sweet creatures with the big eyes. Suzanne and Doug Campbell own the alpaca farm, and on hand to greet the group was Anne Poe, Suzanne Campbell's mom and a fixture at the Marjorie Stewart Community/Senior Center in Sherwood, and the Campbells' son Conor. Poe has become an expert on alpacas and told the kids all about them, starting with how they are different from llamas. Alpacas have "banana ears," are smaller than llamas and are native to Bolivia, Chile and Peru. They are bred for their fleece that is similar to wool, which is used to make knitted and woven items such as blankets, hats, gloves, scarves and sweaters. "In South America, most alpacas are white," Poe said. "Some breeders want all-while alpacas, because the fiber can be dyed any color, but my daughter likes color." The Sherwood herd consists of black, gray, mahogany, brown, fawn and white alpacas, and one of them is named Tony Surprise for his multi-colored, spotted coat. "Every year we give the alpacas a haircut on Memorial Day," said Poe, adding, "Alpacas can run up to 30 miles per hour, and the mothers nurse them until they are 6 months old. When Suzanne's lawn in her back yard needs mowing, she lets some alpacas in, and they eat the grass down." Poe gave the youngsters a list of rules to follow before entering the pen, where the herd included two babies - Indy, who was born July 4, and Willow, who was just two weeks old. "Stand with your hands behind your backs, and if you stand still, they will give you a kiss," Poe said. "They 'kiss' by blowing a little air at you, and you will see that they only have lower teeth. Pet them along the neck and back. Their eyes are wide apart to see danger, so don't pet them like a dog by reaching toward their head." The campers were a little nervous at first about touching the alpacas, but as the kids and animals got more comfortable with each other, they all enjoyed the interaction, and the children were amazed to see one of the babies nursing. After petting and mingling with the alpacas, the kids left the pen and were divided into two groups of five, with one group creating nesting balls of loose fleece. "The fleece has no lanolin, and you need to squeeze it together into a baseball," Poe said. "We put twine through it, and you can wear it like a necklace while you're here. When you get home, hang it from a tree, and the baby birds will have the best nest ever." While one group made their fleece balls, Poe, sitting on a bench outside the barn, read a couple of stories about alpacas to the other group sitting on the ground. The first story was "An Alpaca Coat for Ruby," about an alpaca born in the winter who was cold until the farmer put a red coat on her. The other story was "An Alpaca in my Pocket." Poe said she treasured those books, noting, "It's hard to find books about alpacas because most of them are about llamas." Once everyone heard the stories and made their fleece balls, they moved into the barn where more alpacas were munching hay. Poe explained how the barn is stocked with bales of hay every fall to last through the winter, but at this time of year, there weren't many bales left. All of a sudden, a wayward alpaca named Cocoa startled the kids by running into the barn, and they squealed even though a short time before they had been in the pen with Cocoa and the other alpacas. Conor quickly corralled Cocoa, who was led back to the pen, where the gate was shut firmly this time. The kids also had the opportunity to visit the barn store that was filled with imported Peruvian products and hand-knitted items made by Poe. For the kids, the most popular item was books about alpacas that came with finger-puppets knitted by Poe. The Campbells have been raising alpacas since 1990, and Suzanne Campbell has extensive knowledge of bloodlines, fiber quality and conformation, and consults on breeding pairings and purchases. She hand-spins fleece and loves to work with alpaca fiber, while Doug Campbell has a successful career in the show ring, winning blue ribbons for booth fleece and conformation. The farm also offers breeding services, boarding, brokering and tours. Alpacas of Oregon is located at 21345 S.W. Aebischer Road, Sherwood; for more information, visit AlpacasofOregon.com or call 503-348-6954.